Sports Rendezvous: 2018 FIFA World Cup: Why Buhari is the only Nigerian allowed to touch official trophy. 2018 FIFA World Cup: Why Buhari is the only Nigerian allowed to touch official trophy. 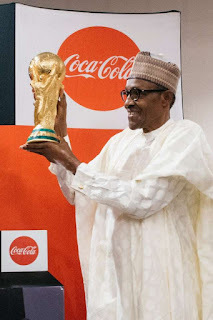 President Buhari is the only Nigerian allowed to touch the World Cup trophy. So the official 2018 FIFA World Cup trophy is in town after its arrival in Abuja on Wednesday, March 7 and President Muhammadu Buhari touched it. Ahead of the 2018 FIFA World Cup in Russia, FIFA and long-time sponsors Coca-Cola are touring with the trophy. The tour kicked off in Russia, host of the 2018 FIFA World Cup and will touch down in a total of 91 cities in 51 countries across six continents before the final.